Part of the fun of skiing is the ride up the mountain. Why not ride in style, preferably with a view. Here are some of the top ski lifts at New England ski resorts, and Top Ski Lifts in The World, from amazing views, to efficient speed and people moving skills, from gondolas, to aerial trams to magic conveyor belts that sweep you off your feet and into your seat for a spectacular trip up the mountain. 1. Okemo has two bubble covered lifts, the most in North America! A Six Pack and Quad with orange bubble covers. Vermont has other six packs at Stratton, Killington and Mount Snow but Okemo’s bright orange high-speed heated chairs are pretty orange and outrageous (but admittedly super comfy) for the wholesome Green Mountain state. 2. Cannon’s Aerial Tramway originally opened in 1938, as the first passenger tramway in North America. Replaced in 1980, the 5,359-foot summit cable car holds 80 passengers and one driver traveling at 1,500 feet per minute on the 2.1 mile. The Cannon tram had to be evacuated winter of 2016, but no biggie. 3. Bretton Woods new gondola, the Presidential Bahn, is a spectauclar lift, from the base this 8-passenger Austrian-Swiss Doppelmayr climbs 1,300 vertical feet in 5 minutes, landing just below the summit of Mount Rosebrook- the center peak between Mount Stickney and West Mountain. The views of Mount Washington and the Presidentials from this gondola and future summit lodge are outstanding. 3. Jay Peak Vermont’s only tram lift shuttles 60 skiers to the summit, dating back to 1966, but significantly upgraded in 2000. Recently, Jay Peak has opened the Tram Haus Lodge, Hotel Jay, Stateside Hotel, and an indoor Pump House Water Park at the base with improved dining and a Tower Bar all in the last few years. 4. Mount Snow’s Bluebird Express six-person, high-speed chairlift with a bubble cover that’s blue arrived in 2011, The Bluebird Express “bubble” was the only lift of its kind in America (until Okemo started blowing orange bubbles 2014). 5. Mad River Glen Single Chair is the most expensive single chair in the world arguably…they paid extra for this $1 million retro replacement for posterity at this old school no snowboards allowed ski institution. This “Ski it if you can” coop-owned area is on the national historic registry. With over 2,000 vertical, and a 3,637′ summit, Mad River Glen is the real deal, just needs real snow. If you want someone to sit next, ski the quads at nearby Sugarbush Resort. 6. The FourRunner Express Quad at Stowe was the first detachable quad in the East in 1986, then fully replaced in 2011 for $6 mill. This 2,055′ vertical chair serves Stowe’s Front Four legendary trails, some of the toughest ski resort terrain in New England. Notably the Four Runner Quad opens at 7:30 weekends, 8 on weekday so you can get 10 by 10 with the locals. Stowe’s Gondola to Mt Mansfield is also impressive, with brand new cabins for 2015, still delivering skiers swiftly up to skiing and lunch at the Cliff House. 7. 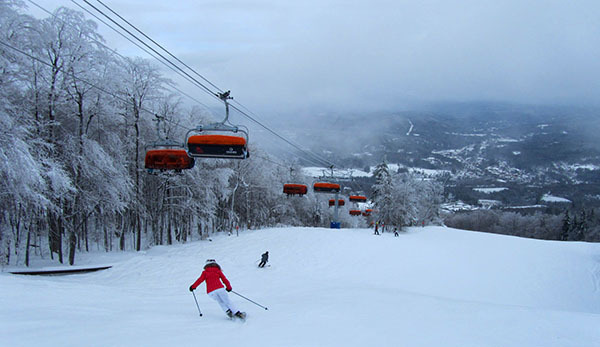 Killington’s The K-1 Gondola provides the highest lift-served terrain in Vermont (4,241 feet). When K1 debuted in 1997 it was state of the art with its funky multi colored cabins, the 8-pack gondolas were completly replaced for 2018-19. The K1 Gondola is powered by manure energy – doesn’t that just beat the crap out of other ski lifts, and it arrives at the 4,241′ Peak Lodge, Killington’s panoramic summit lodge. Snowdon now has a six-pack at the Beast of the East, with a bubble cover, 21 lifts total! 9. Wildcat‘s 1997 installation of the Wildcat Express quad chairlift is still the fastest longest detachable quad in New England, serving 2,112 feet of vertical in just six minutes and one of the most scenic ski resorts in the country with views of Mt Washington and Tuckerman’s Ravine. 10. Sunday River’s Chondola is a hybrid, with six passenger chairs and gondolas, $6 mill in 2008. The Chondola provides day and night skiing and pedestrian access fro dining at the Peaks in the North Peak Lodge, along with indoor comfort for skiers and riders in an 8-passenger gondola cabin after every fourth six passenger chair.